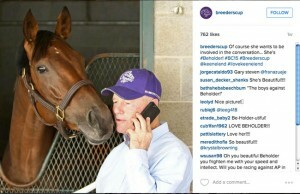 Breeders’ Cup Instagram Tips and Tricks: While you are having a great time at the 2015 Breeders’ Cup, you will definitely want to document your experience with great photos. In this digital age, it is important to learn how to take a photo worth posting online. Even with the various filters offered by Instagram that help photos look more professional and make the subjects look great, it can be tough to navigate the methods behind taking and posting great pictures. So, here are some tips to make sure you are looking your best in your posted photos documenting your 2015 Breeders’ Cup experience. 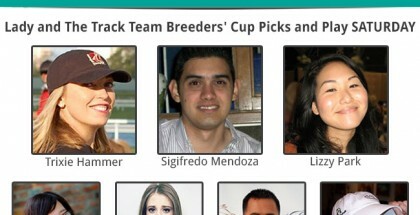 Follow Breeders’ Cup on Instagram to see behind-the-scenes photos. The photo above features beautiful supermare Beholder, who never needs a filter! First, take your pictures with a slight angle. People always look more flattering if their face is a little bit tilted, if they stand to one side with one leg slightly in front of the other, or if they have their hand on their hip. Creating angles provides depth and interest in the photo and creates a slimming effect. Another great tip is to have the person taking the picture be on a higher level than you or to hold your phone or selfie stick above yourself. When the camera is positioned to be looking down on you, it creates a more flattering frame and is an instant slimming technique. Also, play with cropping. Try to have a focal point in the photo; cropping helps people focus on what you really want them to see. Also, don’t be afraid to have pictures off-centered as sometimes this provides a greater visual interest. Remember that it is best to keep backgrounds simple so that you stand out in the photo. Also, try relaxing your face right before the photo and then smiling in order to keep your look natural. The final step is to consider adding a filter. Just remember to really look at your photo first – it may not even need a filter. If you do decide to use a filter, pick one that accentuates the natural color and feel of the original photo. The most important thing to remember is that no one looks completely perfect, so just get out there and have fun! Above all else, just document the fun time you’ll undoubtedly have at the 2015 Breeders’ Cup. 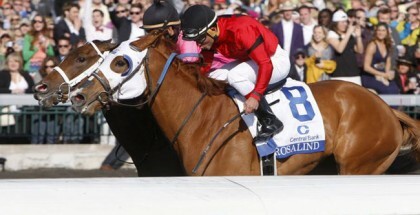 The Breeders’ Cup takes place at Keeneland Race Course in Lexington, Kentucky on Oct. 30-31. 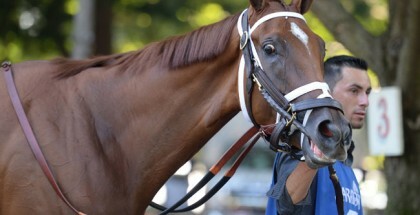 NBC will begin coverage of the Breeders’ Cup Classic at 4:00 pm ET on Saturday.